The human body is just like a complex machine. If any part of the machine has a problem, the whole of the machine goes down. Same is the case with the human body, if you are suffering from pain in any part of your body, your productivity level decreases. In order to perform at an optimal level, you need all your organs and muscles strain free and active. One such crucial pain that inhibits your body’s working is Trapezius muscle pain. In this article, we will highlight the causes of this pain and the exercises you can do in order to get rid of them. The trapezius is one of the most important muscles in your body. It is a smooth and triangular muscle in your back, extends from neck and goes along the spine in the middle of the back along the shoulder blade. There is one trapezius muscle on each side of the spine. Trapeziuses help in raising arms and support the coordination of shoulders and arms. Trapezius pain can limit your body’s movement and reduce your arm strength. It is a very uncomfortable and annoying muscle pain in which you find it difficult to carry out your arm movement properly. Any overhead activity becomes troublesome as you have to bear extreme pain while doing it. It also inhibits your neck movement while causing severe pain. 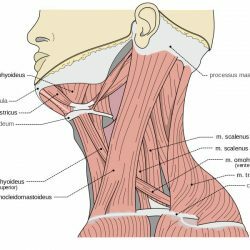 The trapezius muscle is one of the largest muscles in your body and any problem in this muscle will impact the entire body. Injury – Injury to this muscle is one of the reasons behind the prolonged trapezius pain. An injury can occur when the muscle experiences collusion or a severe twist. Falling down, a strong blow to the muscle area can become the cause of this pain. Overuse – If you are engaged in a work that demands extreme usage of this muscle, it is likely that you will experience this pain on a regular basis. For example, if you are engaged in weightlifting with the trapezius muscle, you are more prone to this pain. Sometimes, repetitive low-impact movements of this muscle can also cause this pain. Desk Work – Working on a computer for an extended period of time with stretched shoulders or in an uncomfortable posture may cause this pain to happen. Pressure on the Muscle – if you are engaged in too much backpacking activities on your one shoulder or uneven distribution of weight on both shoulders, chances of getting trapezius pain will increase. This puts extra tension on one trapezius and disturbs the natural balance. This pressure on the muscle can also be caused by heavy one-sided bags or tight bra-straps. Tension/Stress – Tension and stress in your body can reduce the blood flow to trapezius muscle. This can cause less blood flow to muscle and it, in turn, causes pain. Uncomfortable Postures – Sitting or standing in an uncomfortable posture for longer periods of time can cause trapezius muscle to get stretched. Trapezius muscle pain can cause you a lot of problems but it is not that much difficult to deal with. By doing some basic and easy exercises, you can get rid of it. However, if the pain still persists after these exercises, we recommend you visit your physician and get a proper diagnosis for your condition. Ice Application – One of the easiest ways to deal with trapezius pain is to apply ice and take rest. Ice slows down the blood flow and gives time to muscles to heal automatically. Ice application is only considered helpful if it is applied in the first 48 hours of experiencing pain. After a couple of days, you can rely on other exercises. Head and Shoulder Elevation – Elevating the pain area above the heart is always helpful when it comes to dealing with body pains. Since this muscle is already above the heart, you can elevate your head and shoulder while you sleep. Shoulder Shrugs – Shoulder shrugs are a simple exercise that can help you in reducing the trapezius pain. Doing shoulder shrugs throughout the day; helps in keeping the trapezius relax. For better results, you can pull your shoulders all the way to your ears and hold them there for some seconds. Stiffness in trapezius can also be reduced by rolling shoulders in both directions. Forward Stretching – You have to imitate the nodding position in this stretch. Make sure that your chin is directed towards your neck. Hold this position for 15-20 seconds so that your muscles can relax. Crosswise Stretch – Move your head in such a way that your chin approaches the other shoulder. Hold it there for almost 20 seconds and now repeat the same movement in the other direction. Side Stretch – Now pull your head towards the side as your ear approaches to other shoulder. Do this on both sides for 20 seconds. Tennis-Ball Exercise – Use of tennis ball is very effective when it comes to dealing with trapezius pain. All you need is a good quality tennis ball that will not get de-shaped under your weight. Place the tennis ball under your trapezius’s tender areas and lie on it. You can adjust the pressure and location by moving the tennis ball or your body. Keep the ball there for at least 20-25 minutes and if you are unable to bear the pain, you can also do it for 10 minutes. Another application of tennis ball is to use it against a wall for your backside or against a door-frame for the front side of the shoulder. Lying Down – While lying down, you can knead your muscles with your hands. Gently pressing or massaging one side shoulder muscles for 20-30 minutes and then repeating on the other side can really release the tension build-up in the trapezius. Trapezius pain can be very excruciating at times and inhibit your body movement. Chronic pain can be very problematic as it can really disturb your living style. We are sure that our article will be helpful for you in dealing with this pain. If the pain still continues after doing the above-mentioned exercise, you are advised to visit your doctor on an urgent basis.